What I'm knitting, sewing, cooking, baking...maybe other stuff too. I designed this cowl as my entry in the 2010 Ravelympics. I’d planned on making it available as soon as the Winter Games ended, but, being the procrastinator that I am, that didn’t get done. With less than a week left till the new Dr. Who makes his appearance, I’ve decided now is a good time to finally put my little pattern out there in the big wide world. If you knit the cowl, I’d love it if you’d let me know what you think of it. Tilting Tardis caught my eye on Ravelry. I love the askew quality and I hop my neck is long enough to enhance the lean. Thank you for posting this wonderful pattern. (okate on Ravelry). Thanks Kate, for liking my pattern. I hope you knit it, and I know it'll look great on you. Off to check you out on Ravelry. So beautiful,I like it very much and I will knit it next week. Thank you for sharing this wonderful pattern. So beautiful.I like it very much and I will knit it next week. Thank you for sharing this wonderful pattern. I've seen this pattern on Ravelry. 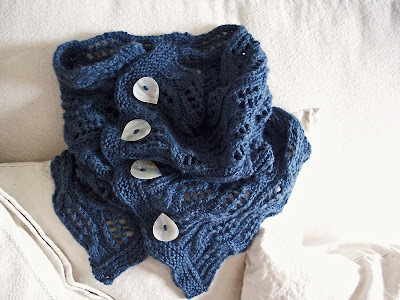 I'll definitely knit this cowl <3 !!! Thank you very much for this pattern ! This is a Flickr badge showing public photos and videos from CowgirlsWithGlasses. Make your own badge here. I've picked up a lot of needlecraft skills over the years, but right now it's all about making art, knitting, a little sewing, and the occasional goodie from the kitchen. The Magpie and Wardrobe. Fashion fripperies from vintage, antique fabrics and jewellery.